By Jason Davis – WASHINGTON, DC (Mar 29, 2019) US Soccer Players - Sporting Kansas City has been many things over 23 seasons in Major League Soccer. The club that was originally called the Wiz and then the Wizards for the first 15 of those seasons won an MLS Cup in 2000. They also produced some of the lowest average attendances in MLS history. The club’s first venue was Arrowhead Stadium, home of the Kansas City Chiefs, and its second was an independent baseball league stadium. Neither helped the franchise turn the corner from an attendance and relevance perspective. That MLS Cup win aside, it wasn’t until the opening of what is now called Children’s Mercy Park and the rebranding of the team to Sporting Kansas City that the club ascended into a place of prominence in MLS circles. Peter Vermes was and still is, the central figure. As a player, he was on the field for that MLS Cup win. As coach and technical director since 2009, everything at Sporting runs through him. No singular person in MLS holds more sway over the direction of a team than Vermes. His longevity in the dual roles he holds speaks directly to his success. Through his Sporting stewardship, Vermes made the pivots necessary to keep his team competitive and stay up with the rest of the league. The longest-tenured coaches in MLS is exactly that because he has always been willing to evolve and adapt. The latest example of that phenomenon is Sporting’s recent turn towards youth. Any list of MLS clubs that have prioritized developing young players since the league’s push to launch academies doesn’t usually include Sporting. Even now, FC Dallas and Real Salt Lake are the leading lights for bringing homegrown players through their systems and then giving them first team playing time. That's partly because Sporting’s effort around young players is still crystallizing. This team relies on a veteran core of Matt Besler, Roger Espinoza, and Graham Zusi augmented by mid-level international signings and organized around a few key principles of play. That means not a lot of room for inexperienced players. It will take a conscious decision to give them time over experienced options for a youth movement to take hold. Still, Vermes is putting the pieces in place. There are two 16-year olds on the roster in Gianluca Busio and Tyler Freeman. Fullback Jaylin Lindsey is 19. Midfielder Wan Kuzain Wan Kamal is 20. The club recently completed the transfer of 22-year old midfielder Gedion Zelalem from Arsenal. Zelalem is a former US youth international with untapped potential. He doesn’t obviously fit the Sporting style of play but could benefit from Vermes’s direction. Sporting clearly believes that Zelalem can improve his game in certain areas and become a future contributor to the first team. With an integrated structure that includes a USL Championship side, Sporting can give Zelalem professional minutes and keep him close for possible chances with the senior team. Vermes launched his plan to bring through more young players in Kansas City a few years ago. It was never a wholesale shift, but rather a strategically staged process that would integrate the young group slowly. The veteran core re-signed in 2018, providing the club with stability in the lineup and the young players a group of mentors. Outside of Zelalem, a recent arrival, we’re talking about a group of homegrown signings all on the young side of 21. Few clubs would hand the bulk of their minutes in a key position to a teenager. Almost none would do so with multiple players at the same time. Lindsey is so far the player given the most opportunity with six starts and seven total appearances in 2018, though he has yet to play this year. There’s pressure on Vermes, however. The turn towards a program that pushes young players from the academy to the first team requires playing them. Talk is cheap. It’s actions that matter. Perhaps Zelalem, as the oldest and most accomplished of the group, will get the first chance to prove himself at the MLS level on a regular basis. Or perhaps that chance will go to one of the younger midfielders, players who came in the Sporting system and presumably have an innate understanding of the role their position plays in the wider plan. One of those players is Busio. Busio. He signed with Sporting on a homegrown contract as a 15-year old in 2018 after playing in the academy for a year and enters his first full season as a 16-year midfielder. 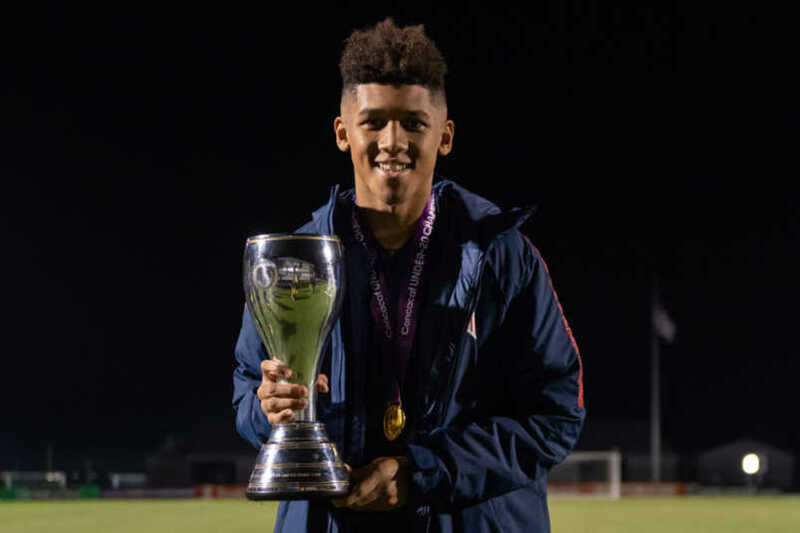 Busio is from North Carolina, making the choice to move to Kansas City over other MLS clubs that would have gladly welcomed the US youth international. That's an indication of Sporting's aggressive ploy to attract the country’s best unattached players. A skillful player, Busio is one of the more highly touted prospects in his age group and might be a long term contributor for Sporting. In other words, Busio could have value as a salable asset. Vermes has no qualms about selling players if the right offer comes and points to that possibility as one of the reasons for bringing through young players. Sporting famously watched Erik Palmer-Brown leave for nothing after breaking through with the first team. Sporting has been smart with its allocation money. The club has nine players making more than the non-DP maximum, possible because of TAM. This is not a club that can spend its way to championships. Bringing money back into the club through the sale of players is part of the business that Vermes is happy to engage in. The youth movement is both a competitive move and one driven by economics. There are no guarantees that Busio, Wan Kuzain, Freeman, or even Lindsey will be with the team long term. Vermes might be playing loose with his stated intentions in part because it serves the purpose of getting those potentially valuable players under Sportings control. Sporting is currently navigating the Concacaf Champions League in addition to the start of the MLS season. Vermes has pushed his first choice team, creating issues of fatigue in the squad. Despite the heavy schedule, he’s been reluctant to use this cadre of youngsters. Of the group highlighted here, only Busio has logged any minutes in 2019. The time is coming for Vermes to put his faith in the kids. Not just to give his veterans a rest, but to prove to the group he has and players coming in behind it that Sporting’s turn toward youth is more than just a feint in that direction. No coach wants to fully sacrifice winning on the altar of player development. That said, if there’s no proof that Sporting will play its youngsters, the pipeline will dry up.